I love this photo taken years ago of me and Master 6 (he was about 2 at the time). 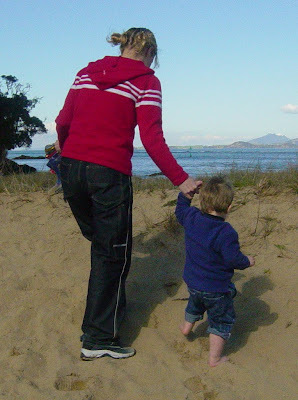 I think it is more about the memories than the photo itself... hot chippies at the beach and a walk to view Ngunguru sandspit, little clumsy feet and his finger pointing at every little object to be seen. The simple outings are often the most precious. Must do it again sometime! you look like shemayah from the back :) good times kristy! Awwwww, what a sweet picture!